Hypothyroidism is a medical condition that occurs when the thyroid gland does not produce enough thyroid hormone. An under-active gland slows your body down, decreases your metabolism, lowers your body temperature and can cause weight gain. Typical symptoms of hypothyroidism include fatigue, constipation, dry hair and menstrual irregularities. This condition can become serious if left untreated. Your doctor will prescribe the right treatment for you. Eating the right diet for hypothyroidism is also important to help decrease symptoms. Delay eating high-iron foods when you take your thyroid medication. Iron can interfere with how your body absorbs and uses the treatment necessary for hypothyroidism. Food sources of iron include red meat such as lean beef and veal, spinach, leafy greens, egg yolks, chickpeas and lentils. Eat iron-rich foods at other times of the day when you are not taking your medication. For instance, if you take your medication in the morning, eat only egg whites with breakfast or save eggs for a mid-day lunch with leafy greens. Avoid eating foods that contain soy at the same time that you take your thyroid hormone medication. According to the University of Maryland Medical Center, soy may interfere with absorption of the thyroid hormones. Soy foods include tofu, soybeans, edamame or tempeh; do not consume these foods at the same time or within an hour or so of taken your medication. Read food labels carefully to avoid eating foods that could affect proper absorption of your medication. This includes soy and iron ingredients or additives. Avoid foods that contain soy protein, hydrolyzed vegetable protein or textured vegetable protein, as these are also soy-derived. Soy is present in many packaged and processed foods including vegetarian meat alternatives like veggie burgers or deli meats. Also check labels for iron content as many cereals or grain products may be fortified with this nutrient. Remove vegetables that may affect thyroid function, from your diet. 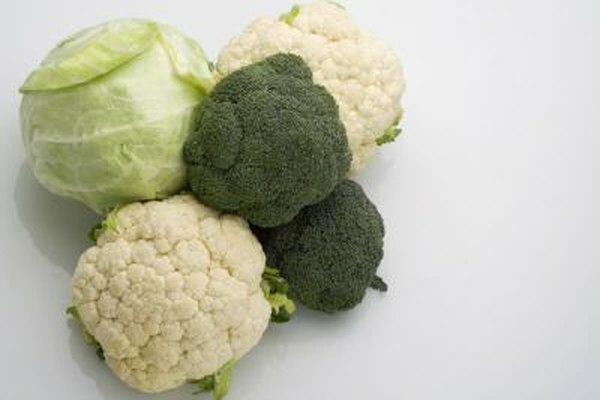 These include broccoli, cauliflower, cabbage, kale, mustard greens and turnips. Consider replacing these vegetables with other fresh vegetables that have little affect on thyroid function such as mushroom and peppers or sea vegetables including algae and kelp. Eat fruits to replace foods that may affect hypothyroidism. Adding fruits to your diet may eliminate your consumption of other foods that affect medication absorption rate. Fruits, in particular berries such as blueberries, raspberries and strawberries, are high in antioxidants, which help strengthen the immune system and may help prevent health conditions or certain cancers. Consult with a physician or medical professional to making any dietary changes that could affect your health.